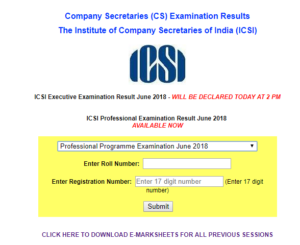 The Institute of Company Secretaries of India has announced the ICSI CS Professional result 2018 (Company Secretaries) examination conducted in June 2018. All the candidates appeared for the exam can check their scores out through www.icsi.edu. Along with the Professional Programme, the Executive results will also be issued today by 2 PM. The Institute has also provided the names, roll numbers and photographs of all the first three rank holders. Tanu Garg secured the first position, Devansh Sanjaybhai Shah secured second and Nishant Ketan Chothani third position. To figure out the ICSI CS Professional result 2018, candidates required to enter their roll number and 17 digit registration number. These should be filled correctly otherwise, candidates will not be able to check out their results. Candidates can also download E-marksheets for all previous sessions. The Institute has also issued the list of rank holders who have qualified all the papers of Professional Programme exam without exemption in any paper in one sitting in June 2018. This list comprises of total names and registration numbers of 16 students. Out of these 15 ranks, only seventh rank is secured by two students – Rishabh Jain and Tarak Sanjay Shah. To check out scores, candidates must be apprised off with the web address of authenticated web portal of the institute – www.icsi.edu. On the front page, candidates will get three links related to the Professional Programme – “Click Here To View Result And Download E-Mark sheet”, “All India Provisional Merit List” and “Top 3 Rank Holders”. Candidates have to choose the first link and follow it. On the next page, candidates will have to enter their roll number and registration number. Later on, check out the marks. To become a company secretary, candidates need to undergo an Executive and Professional Programme after completion of graduation. Or, if a candidate has completed 10+2 and wants to become a Company Secretary has to undergo Foundation Programme as well. For the professional programme, only those candidates can pursue who have qualified the ICSI CS Executive programme. Executive Programme Result To Be Issued Soon. Stay Connected With ALL INDIA ROUNDUP To Get The Updates.